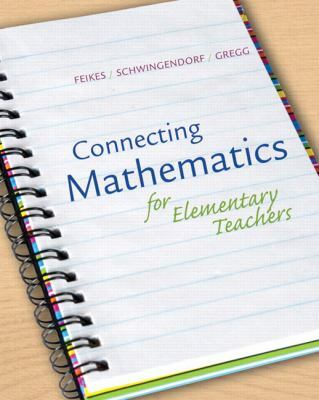 by Feikes, David, Schwingendorf, Keith, Gregg, Jeffrey P.
Feikes, David, Schwingendorf, Keith, Gregg, Jeffrey P.
This book provides general descriptions of children's learning and is intended to help show how children approach mathematics differently than adults. By connecting children's thinking to your own learning, we hope that this book will improve your understanding of both mathematics and children's thinking, thereby enhancing your teaching of mathematics to children. The more you understand mathematics and how children think about mathematics, the better teacher you will be! Each chapter section contains insights and examples of how children come to understand mathematics. Many of the descriptions of how children learn are based on research, but some are based on the authors' personal experiences with helping children learn mathematics. As appropriate, the authors also include information on the "why" behind certain mathematical topics, how to incorporate manipulatives into the classroom, and some activities to try. Each section also has "Questions for Discussion" to encourage reflection while learning. At the end of each section are "Problems and Exercises" that are specifically designed to help show how children learn mathematics. The material is presented by topic, following the standard topics covered in a traditional mathematics for future elementary or middle school teacher's course.Feikes, David is the author of 'Connecting Math for Elementary Teachers: How Children Learn Mathematics', published 2008 under ISBN 9780321542663 and ISBN 0321542665.